Waste incinerators are widely documented as a source of air pollutants including acid gases, nitrogen oxides (NOx), sulphur oxides (SOx), heavy metals, particulates and persistent organic pollutants (POPs) such as dioxins and furans. Incinerator proponents claim to have reduced air emissions to acceptable levels over recent decades by installing very expensive pollution filters and scrubbers which are collectively known as APC (Air Pollution Control). When working, the filters capture a lot (but not all) of the pollutants that would otherwise escape to atmosphere. The highly toxic compounds are then transferred to ‘fly ash’ which is so contaminated that it must be dumped at special hazardous waste landfills. Nevertheless, significant air pollution escapes the APC process, which can break down, lose efficiency or be bypassed during plant failures or emergencies. Municipal waste is a highly diverse mix of materials with varying calorific value. The high variability of municipal waste makes it easier for hazardous materials to slip though the separation processes that may be in place prior to waste entering the incinerator where they can are converted in toxic gases and particles. However, even non-hazardous materials in MSW such as fabrics and furnishings can be converted into hazardous emissions as they may contain or be treated with chemicals for fire retardation (polybrominated diphenyl ethers), stain resistance (perfluorochemicals) or with nanoparticles to reduce UV penetration or to prevent bacteria. Other materials may be non-hazardous in the MSW stream but are converted into hazardous emissions when burned such as poly vinyl chloride (PVC). The result is that most modern waste incinerators are still significant sources of hazardous air toxics emissions that are difficult to control. Some of the pollutants such as mercury, dioxins and polycyclic aromatic hydrocarbons (PAHs) can travel great distances and contribute to contamination on a global level as well as contaminating local soil and produce. Less persistent pollutants such as acid gases, nitrogen oxides (NOx), sulphur oxides (SOx) can still be highly toxic and impact on public health at a local and regional level around individual incinerators. Mercury (Hg) is a toxic heavy metal that will soon be restricted by an international legal convention (The Minamata Treaty54). Modern waste incineration is the fifth highest source of mercury pollution from anthropogenic sources in the world today55. Dioxins (polychlorinated dibenzo-p-dioxins) are persistent organic pollutants (POPs) restricted under the Stockholm Convention on Persistent Organic Pollutants and one of the most toxic chemicals ever evaluated by science. Waste incineration has been estimated as the highest source of dioxin air emissions in the US (1000 Grams ITEQDF a/year) followed by secondary metal smelting (600 Grams ITEQDF a/year) and medical waste incineration (500 Grams ITEQDF a/year). Claims by waste incinerator proponents that they produce ‘acceptable’ air emissions are seriously undermined by the facts. Australia currently has no regulatory framework for nano-materials and therefore cannot control the types or amounts entering our municipal waste streams. There have been significant public health concerns related to the effects of nano-materials in the human body. As these particles bypass the normal defence mechanisms of the body and enter the blood stream and organs directly, the failure of waste incinerators to be able to control nano-pollution may represent a significant threat to human health. There are significant scientific data gaps on the health impacts of nano-materials yet current research is uncovering serious adverse health impacts58. There are no air quality standards or stack emission limits for nano-particles in Australia hence the use of the precautionary principle should be applied in relation to all nano-pollution releases. There is overwhelming evidence of the harm to human health caused by ultrafine particulates which are known to be emitted in high amounts from all forms of incinerator technologies. These small particles can lodge deep in the lungs and cause respiratory and cardiac diseases. There are currently no state or national air quality standards, license conditions or other regulatory measures to protect the Australian community from ultrafine particulates (those less than 0.1 microns in size). Waste incinerators release a diverse range of toxic substances to the atmosphere. Some toxic compounds are short-lived and some are persistent and all have varying degrees of toxicity. Once released from an incinerator toxic materials may be carried long distances or deposited in nearby soil and surface water. How these toxic releases affect human health is difficult to assess as people may be exposed to multiple toxic compounds at one time and exposures may very between individuals even in the same location. Some groups of people, such as young children, the elderly and immune compromised individuals may be more susceptible to health effects than others. There is also the issue of latency of onset of symptoms after exposure which can take decades. 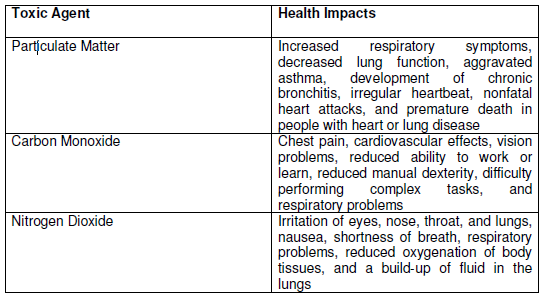 All of these issues make it difficult to predict health impacts of incinerator emissions and to attribute causality between an individuals sickness and a specific source of emissions. This can be complicated further by the presence of other polluting facilities or sources of pollutant exposure. Assessing the health impacts of emissions is usually falls into the two categories of predictive assessment (health risk assessment) or epidemiological studies examining current or past population group exposures. Health risk assessment is a form of modelling often criticized for its high levels of uncertainty and inability to consider the impacts of chemical mixtures and cumulative impacts over time. Epidemiological studies are considered more reliable but usually identify population health impacts only after they have occurred. The result is that it can be very difficult to assess the impacts of waste incineration until after they have occurred. Incineration proponents rely almost exclusively on health risk assessment when seeking regulatory approvals and this has been criticized by some health professionals. A number of waste incinerator proponents in Australia have pointed out that Japan, as an advanced industrialised economy, has numerous incinerators operating ‘successfully’. Japan has very limited space available for landfill and in the 1970’s adopted waste incineration to manage its waste streams. Now Japan has the dubious honour of being the largest waste burner of any country in the world with nearly 70% of the world’s waste incinerators burning 70% of Japan’s MSW. The price of this commitment to incineration has been high in terms of public health risk. Japan now has dioxin contamination levels ten times higher than any other industrialised country and is now struggling to reduce dioxin emissions. A large cohort study in Japan has identified increased symptoms associated with proximity to waste incinerators, particularly in children. Another study investigated an area in Japan near a MSW incinerator that had high levels of dioxin contamination in soil and an unusually high rate of cancer in residents. The study tested blood samples from 13 women and 5 men living within 2 km of the incinerator. Levels of dioxins were raised considerably in the residents compared to background levels found in the general population. For instance, women had an average blood level of 149 pg TEQ/g lipid and men 81 pg TEQ/g lipid, whereas the background level for the general population is in the range of 15 to 29 pg TEQ/g lipid. The authors commented that increased exposure in the residents was considered to be due to direct inhalation of dioxins from the stack gas of the incinerator and by intake of local vegetables contaminated by stack gas. “Our results support the hypothesis of a statistically significant increase in the risk of dying from cancer in towns near incinerators and installations for the recovery or disposal of hazardous waste”. Those townships in the proximity of MSW incinerators had the highest excess cancer mortality for populations of all the towns studied. France also has a high proportion of waste incinerators compared to most other countries. Researchers conducted a study in the area of Doubs, eastern France, to investigate clustering of two types of cancer, soft tissue sarcoma and non-Hodgkin’s lymphoma, near to a MSW incinerator. The study was undertaken following a report of high dioxin emissions from the incinerator. The study found highly significant clusters of both cancers in areas close to the incinerator but not in other surrounding regions. The release of toxic air emissions from incinerators can have a significant impact on human health. Because toxic emissions can have a significant lag time or latency period before their human health impacts become obvious scientific studies have only recently emerged that acknowledge the scale of public health impacts from waste incinerators. A range of public health studies and contamination investigations related to waste incineration are outlined below. The public health impacts associated with incinerator technologies have been documented by internationally recognised scientists in the fields of respiratory and cardiac medicine and epidemiology.